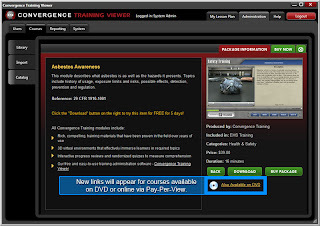 We’ve added some additional links on the details pages of our courses in the integrated catalog in Convergence Training Viewer. The links will show up when the course can be purchased in other formats. Most of our CBT titles are currently available in DVD format, and soon they will be available online via pay-per-view. You don’t need to perform any updates to get this feature, it will be available when CTV connects to the catalog.